We have a track record of supplying various inner and outer blast furnace equipment like cooling pipes for the domestic blast furnace market for over 40 years. 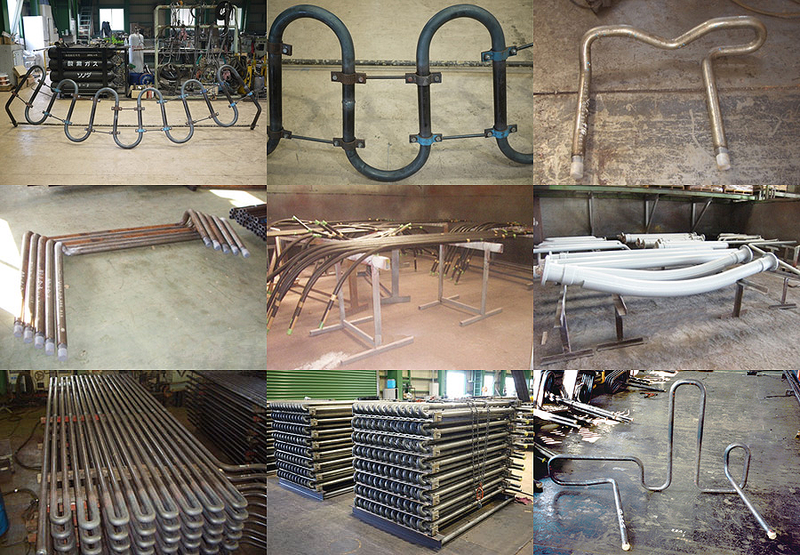 We have delivery records to leading steel manufacturers like Nippon Steel & Sumitomo Metal Corporation. We also have indirect exporting experience to Germany, USA, Mexico, China, and etc. Minimal R bending process is a special technology with an extremely small bending radius in relation to the pipe diameter (1.0D or less). There aren’t any welding points, so it can eliminate any defect due to welding. Since it’s processed seamlessly, it’s aesthetically superior. There aren’t any joints, so parts like elbows, tees, etc. aren’t necessary. Since there isn’t any welding, auxiliary materials like gas and welding rods aren’t necessary. It can reduce labor costs for welding as well as nondestructive inspection costs like RT, UT, PT, etc. Since it would only involve the bending process and not require welding, it can shorten labor time. * Operations that can be omitted due to the bending process technology:groove processing, alignment work, welding operation, pressure test, nondestructive inspection, etc. Biomass and RDF power generation facilities, boiler facilities (superheater and economizer), etc. Electronics Components Manufacturer – Nidec Copal Electronics Corp.